Jussie Smollett attends the ‘Empire’ Season 5 world premiere during the 2018 Tribeca TV Festival on September 22, 2018 in New York City. 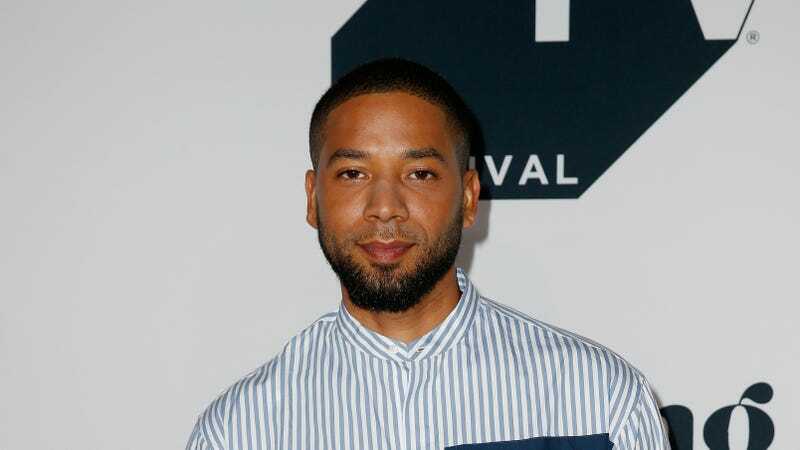 Investigation is underway regarding the recent Jussie Smollett attack as law enforcement officials and fans alike strive for answers. Now, the saga continues as a woman who lives in the same complex as the 35-year-old actor-singer is claiming to have seen a suspicious white man loitering nearby shortly before the reported attack, while she was taking her dogs outside. The unidentified woman spoke with TMZ, informing them she saw a man she describes as a “redneck” outside of the building she shares with Smollett at around 12:30 a.m. Tuesday pacing back-and-forth between the parking garage and entrance, smoking a cigarette with an agitated demeanor. He was also apparently staring at another man approximately 300 feet away, standing near another entrance. “He looked out of place,” she said, noting she returned to the building after being “creeped out” by the man. She described the man as white with facial scruff, wearing a blue winter beanie, a blue zip-up hoodie sweatshirt, too-short blue jeans that exposed his “thick, grey hunting socks,” and camel-colored dress shoes. The most notable thing she claims to have spotted, is a blue and white rope or clothesline hanging from the white man’s sweatshirt. As previously reported, Smollett claimed to CPD that he was attacked with a noose and chemical substance believed to be bleach. After hearing of Smollett’s attack, the woman informed the building’s concierge, who then directed her to contact detectives. As more details come in, hopefully we’re getting closer to finding some concrete answers. News Outlets Were Comfortable Calling Jussie Smollett&apos;s Attack &apos;Homophobic.&apos; Why Didn&apos;t They Call It &apos;Racist&apos;?